What is a Vocation? This is a question that all Catholic students get asked at some point. Unless we begin discussing vocations at an early age, the students will not be considering them later in life. This is why Salt + Light Television, in partnership with the Dufferin-Peel Catholic District School Board, and in cooperation with the Archdiocese of Toronto developed Make The Call. 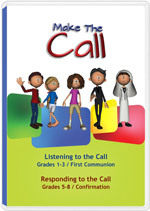 Make The Call is a video series on vocations created to supplement the Ontario Catholic Elementary Curriculum. It was carefully designed to ensure a focused and deliberate introduction and development of the concept of vocation thorough active and consistent discernment. Each video presents an age-appropriate view and provides a clear understanding of the single, married, religious and ordained lives. The first two videos are perfect for the sacrament years of 7-8 and 12-14. The Grade 11-12 video will help students in discerning and making some of the career choices that come around that age. The vocations material in this video can also be used as part of a religion or philosophy course in Grade 12. 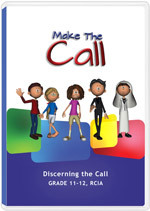 Make the Call is a perfect resource for the classroom, but also for parishes and homes.